New York based artist Virginia Overton has created four discrete, yet related, sculptures for ALL RISE. In keeping with her practice, the works are fabricated of materials salvaged from within five miles of the site, ranging from rough pieces of broken concrete to structural fragments of steel and relatively formal lengths of aged clam wood, balanced, tied, suspended in varying states of motion and arrest. 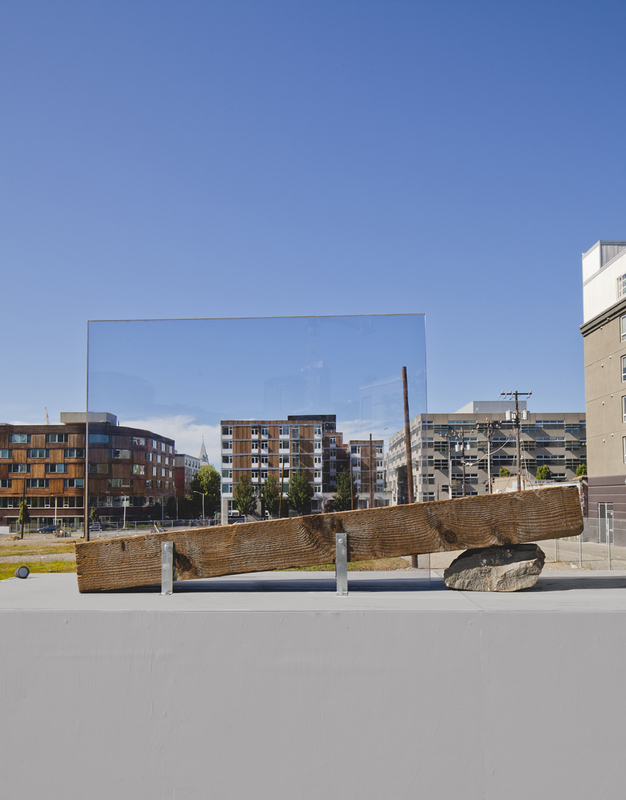 Situated atop four large plinths at Denny Way, the pieces superimpose on a skyline riddled with similar imbalance: volumes of building punctuated with lanky construction cranes. Overton's combines are at times overtly harnessed and others simply set, making in each a palpable volume and force. The series was composed during a week's visit to the Northwest. Virginia Overton was born in Tennessee and lives and works in New York. Recent solo exhibitions include: White Cube, London; MOCA North Miami, Florida and Storm King Art Center, Mountainville, New York. Other solo exhibitions include Westfälischer Kunstverein, Münster; Kunsthalle Bern, Switzerland; Mitchell-Innes and Nash, New York; The Kitchen, New York; and The Power Station, Dallas. She has been included in group exhibitions at the Whitney Museum; MoMA PS1; SculptureCenter; White Columns, New York; Disjecta, Portland; White Flag Projects and Contemporary Museum of Art, St. Louis. She is currently working on a permanent installation for the Columbus Ohio Public Library.